January 03, 2018 - The School of Information Technology and Engineering (SITE) has been designated as a Microsoft Certified Testing Center by Microsoft Philippines. The recognition came after Mr. Rucelj Pugeda and Carlos Babaran. 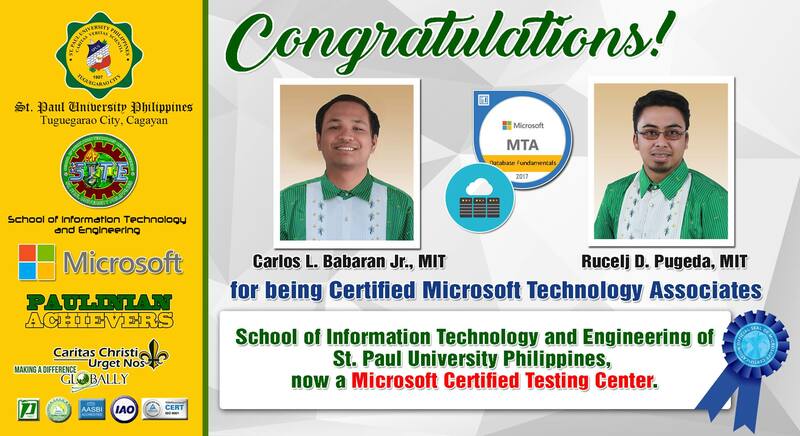 Jr., IT faculty members, passed the certification examination for Microsoft Technology Associate (MTA) on November 7, 2017. As a testing center, SPUP-SITE will cater on the areas of Microsoft Technology Associate and Microsoft Office Specialist.